EmailId Email address will be treated as your user id. Provide your registered email and click on "Reset Password"
An email will be sent to you with a link or URL for resetting your password. Please refer to registration activation email sent during sign-up. The user id is your registered email id. We have sent an email to your 'registered email'. Please check your email and follow the instructions to activate your account. We have sent an email to your 'registered email'. Please check your email and follow the instructions to reset your password. Your account will be upgraded to the new online billing portal and once upgraded, your registered email will be assigned as your user id. SecurityQuestion Select Security Question What is your first pet's name? What is the name of your favorite uncle? What is the name of your favorite teacher? What was the make of your first car? Your security answer will be required to reset your password in the future. Manage all of your properties and billings needs using a single account. Use our Fast Payment feature to pay your HCIDLA bills. Receive convenient E-statements, coming-due notifications, and RSO Certificates. Submit forms to us online using the document-attachments feature Don’t have time to register? Use our Fast Payment feature to pay your HCIDLA bills. Setup an owner-representative account to allow online access to your agent/management company. 1200 W 7th Street Los Angeles, CA 90017 Phone: (877) 614-6873. (Q1) Why should I register instead of using the front page pay my bills? (A1) The advantage of registering a property under your account allows you to request exemptions, update billing contact, manage multiple properties, and receive email notifications about your property. (Q2) Where can I find my APN or Statement number? (A2) You can find this information on the top right of your bill. (Q3)I forgot my username and/or password, how can I retrieve it? (A3) You can click here to recover your password. (Q4) I need additional help, how can I contact you? (A4) Please contact us by email by clicking here or by calling our Billing and Collections Unit Helpline at (877) 614-6873. They are open Monday through Friday, 9 AM to 4 PM. (Q1) Why did I receive this bill? (A1)HCIDLA has issued you with this bill because your property falls under the jurisdiction of the RSO and/or SCEP. Inclusion into the RSO or SCEP is not voluntary and is based on a combination of factors pertaining to your property's location, the number of total units, the property type, and the year built. Whether or not you decide to offer the property for rent is not a factor in determining why you were issued this bill. Property owners who are not in the rental housing market and who are in receipt of an Annual Bill can apply for an exemption from the fees by completing an annual Exemption Application (EC Form). Please visit www.hcidla.lacity .org to learn more about the RSO and SCEP. (Q2)This property is my personal home. Am I still required to pay? (A2)If you do not demand or collect rent, you are not required to pay the fees; however, you are required to apply for annual temporary exemptions for each non-rental unit on the property. See the enclosed EC Form for further instructions. (Q3)I am collecting rent but what exactly am I paying for? (A3)The $24.51 per unit RSO fee goes towards providing RSO services administered by the City and also provides the owner with a valid copy of the Statement of Registration once fees are paid and with the completion of the annual Rent Registry. A landlord cannot legally collect rent from a tenant unless they have provided them with a copy of a valid Statement of Registration Certificate . The $43.32 per unit SCEP covers the cost of an initial "SCEP" inspection, a re-inspection (if necessary), and also covers the hearing costs if the property is referred to the General Manager for Non-Compliance . It does not cover the cost of a "complaint" inspection. (Q4)What will happen if I do not pay the fees? My tenants have not paid any rent. Do I need to pay? (A4)A landlord shall not demand or accept rent for a rental unit without first servicing on the tenant a valid Statement of Registration, to be issued only when Annual fees are paid and with the completion of the annual Rent Registry. Failure to pay the fees by the due date will result in the assessment of delinquent penalty fees and referral to a private collection agency if fees remain unpaid. Please note that the Statement of Registration certificate is needed to proceed with a lawful eviction . (Q5)What year am I getting billed for? (A5)The Annual Bill is for the current calendar year (January - December). The RSO/SCEP fees are not prorated. For instance, if you rent out a unit for a single month out of the year, the fees are the same as if you rented it out for the entire year. (Q6)How do I pay my bill? (A6)We offer the following three (3) payment methods: Online: Log on to HCIDLABill.org to apply for exemptions and/or pay your bill. For returning customers, please use your registered email address and password. New customers will need to register using the APN and Statement Number printed on the upper-right portion of the bill. Mail: Use the PAYMENT COUPON attached to the bottom of your bill to enter debit or credit card information or attach the coupon to your check payment. DO NOT SEND CASH To ensure accurate payment posting, be sure to submit payment for each property with a corresponding payment coupon. Enclose your payment in the PAYMENT ENVELOPE and remember to add a stamp. Walk-in:	To make your payment in person, you may visit any of our HCIDLA Public Counters. Please see the reverse side of the Annual Bill for a list of counters and payment methods. (Q7)Whom do I make the check or money order payable to? (A7)Make your check or money order payable to "City of Los Angeles - HCIDLA." Do NOT mail cash. Be sure to write your APN on your check and don't forget to enclose the payment coupon. (Q8)I sold my property. Am I still responsible for the bill? (A8)Disregard the bill. No Response is necessary. Please note that the bill is the obligation of the owner on title. If you are considering or negotiating the sale of your perty, you are still responsible for the fees. HCIDLA will not reimburse you in the event that you sell the property after paying the fees, nor will we waive penalty fees due to failure to complete the sale. (Q9)I exempted my units last year. Why am I required to do this every year? (A9)The HCIDLA relies on owners requesting and/or renewing temporary exemptions annually . Property use may change from one year to the next. When there is a change to the status of the property, HCIDLA must be notified so records can be adjusted in a timely manner. (Q10)I exempted my units but I also paid-the registration fees. What will happen? (A10)You are NOT required to pay registration fees for exempted units. If a Statement of Registration certificate was issued to you, HCIDLA will NOT retroactively process your exemption request. It is the owner's responsibility to ensure the accuracy of their payment. (Q11)Do I have to pay even if I am not renting any units? My relatives live in the back house and I do not charge them rent to live there. Should Ipay fees on this unit? (A11)No, but exemption(s) must be requested annually for any units occupied by family members where no rents are collected - this is the 'T3" exemption. Please refer to EC Form for instructions. (Q12)How do I claim an exemption? (A12)A. There are two exemption categories a property owner may be entitled to: 1. Temporary Exemptions are for owner-occupied units (Code T1) ; units occupied or used for storage but no rent is being collected (Code T3) ; and units that are boarded, vacant , and secured	(Code S5) . Temporary exemptions must be requested or renewed on an annual basis using the EC Form or online. Please submit using the enclosed Exemption/Registry envelope. 2. Conditional Exemptions are longer-term exemptions. For eligibility information and to apply, you can download the Conditional Exemption Application at	hcidlabill.org	and click on FORMS. Copies are also available at our regional offices (see reverse side of the bill for office locations). For more information, call (866) 557-7368. (Q13)How do I claim a "Vacant" Unit exemption? (A13)You may request a vacant unit exemption (Code S5) for any unit that is boarded, vacant, and secured using a commercial-style lock for the entire year. If your unit(s) meet this requirement, you may apply for the S5 exemption by completing a "Vacant Unit Notice" form, which must be notarized and recorded with the Los Angeles County Registrar Recorders Office. The notarized and recorded form must be submitted to HCIDLA along with a completed EC Form for the applicable year. (Q14)If Iclaim an exemption for a unit(s) at the beginning of the year and then rent it out during the year, what do I need to do? (A14)You must pay the annual registration fee in full within 10 days of the lease or rental agreement being signed. Failure to do so will result in the assessment of delinquent fees for the rented unit(s). Proof showing the commencement date of the lease/rental is required with submittal of payment. (Q15)How would I know that my exemption was accepted after I filed it? Will I get an adjusted bill? (A15)No, the Department does not issue an adjusted bill. If you filed online at http://HCIDLAbill.org , you can print your confirmation . If you requested exemptions by mail or in person, fill out the EC Form and deduct the fee of the unit(s) from the total amount of the bill, depending on whether the property is subject to the RSO and/or SCEP fees . To check your exemption status, visit our website at	www.HCIDLAbill.org and log into your account using the APN and Statement Number printed on the Annual Bill. For additional information regarding your account, please email us at HCIDLA.billing@lacity.org You may also contact our Billing and Collections Unit Helpline at (213) 27S-3292	or (877) 614-6873. Video tutorials and forms are available online at www.HCIDLAbill.org. Customers have one year from the date of payment to apply for a refund (Chapter 10, Article 1, and Sec. 5.170 of the Los Angeles Administrative Code). This time limitation is applicable regardless of whether there are pending requests: for penalty fee waiver, exemption claim, or Senior Inspector Appeals, and other items. 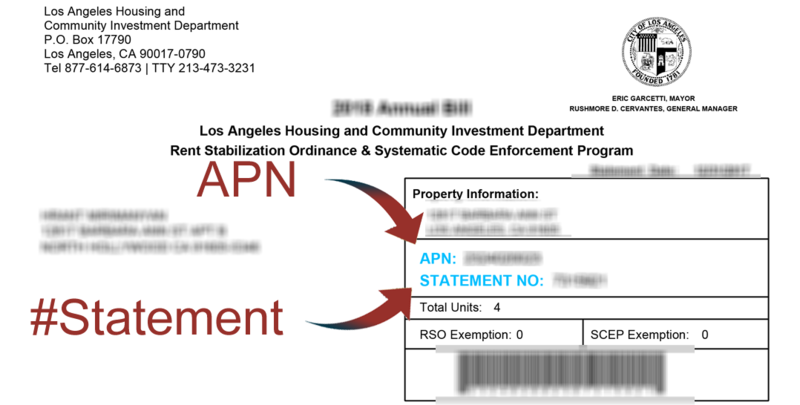 Please complete the form titled CLAIM FOR REFUND APPLICATION along with your proof of payments, and supporting documentation, then submit to Los Angeles Housing Department, attention: Accounting. Customers must provide the reason for the refund claim and submit proof to support the claim, e.g. front and back of a cancelled check, credit card, receipts, etc. Required information and documentation supporting the Claim for Refund Application were listed in HCID Refund Request Requirements to include but not limited to: APN of the property, Address of the property, your complete address, and your daytime phone number. There are too many unsuccessful log-in attempts. Your account will be locked after one more unsuccessful attempt. Copyright © 2012 - 2019 Los Angeles Housing Community Investment Department (HCIDLA). All Rights Reserved. Our website requires access from a browser that supports TLS1.2 security protocol. Use a browser that supports TLS1.2 security protocol to access our website. The following is a list of common browsers that are compatible with our website. TLS1.2 is usually enabled by default in the newer browsers. Google Chrome 33 or higher. Mozilla FireFox 34 or higher. Apple Safari 8 or higher.